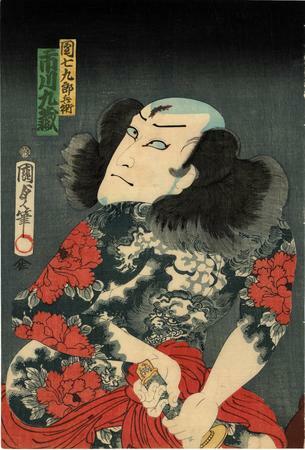 An actor in the role of Danshichi Kurobei, heavily tatooed with lion and peonies. The identification of the publisher as Mikawaya Denbei is a bit of a problem. The seal that appears on the print is found in Marks, but only for an unknown publisher of Utamaro prints from ca. 1805. This print dates from more than 60 years later. Also, we do not recall how this original attribution to this particular publishing name was made. The name of this publishing house does not appear anywhere but on this site. Further research is necessary.